The thought of having a complete plumbing installation fitted in your home or business may seem like a daunting one. That’s why, when it comes to plumbing, it’s certainly handy to find someone who knows their stuff. Having running water in your home or small business is useful for so many reasons that it’s worthwhile making sure your plumbing system is not going to let you down and will be working well for many years to come. At Robert J Dutton our years of experience in the plumbing industry mean that we know our way around the pipes in your property pretty well. In fact, we can help with all manner of plumbing problems, from the smallest leaky tap, to a totally backed up sink. While we pride ourselves on offering a speedy and reliable service in the case of an emergency, we also carry out larger jobs for a wide range of clients, which can include a complete plumbing system installation, where needed. And this doesn’t just mean getting all the right parts in the right places, there’s so much more to it than that. Our customers find it reassuring to know that the service we provide will see the whole job through from start to finish and will feature the whole package, including the system design, concept and materials to be used, as well as the actual fitting. We can offer domestic and commercial plumbing installation to homes and businesses all over the East Midlands and we pride ourselves on an honest and reliable approach in everything that we do, starting with the initial quote. We don’t believe in springing additional costs on our customers once the job is half done and that’s why, when we come out to quote for a job we will be upfront, honest and realistic about the work entailed before we begin. 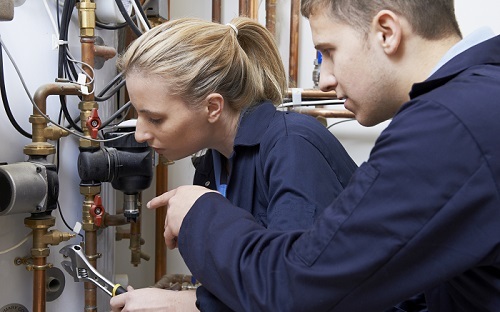 We can carry out a complete installation of a plumbing system to be used for both domestic and commercial purposes and we will also look at any maintenance and repair jobs that you need doing while maintaining a friendly and professional approach. Whether you’re renovating a house, or your old plumbing system has about given up the ghost and could do with an overhaul, our team of plumbers can help. Fitting a complete plumbing system is a complex job, but it can be completed well when carried out with the right level of know how. And, when it comes to plumbing and heating, we have been providing solutions for over 40 years in Loughborough and beyond. Our team are members of the Association of Plumbing and Heating Contractors, Worcester Bosch Gold accredited and we are also a “Gas Safe” registered company, which means we are able to handle all kinds of plumbing issues, heating repairs and installations. It’s that level of experience and knowledge that we take with us into every job we undertake, be it large or small and we always aim to do it with a smile. If you require a complete plumbing system installation in your home or business, then please feel free to contact our team today for more information, we’d be delighted to help.